At Windstar, we don’t just take you to fascinating destinations, we take you into them, giving you unique access to knowledge and activities that enhance your understanding of the places you visit. 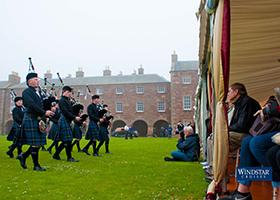 Complimentary Destination Discovery Events treat you to iconic experiences that capture the essence of your locale. Guest Lecturers intrigue you with regional topics, adding new dimensions to your voyage. And small group excursions take you to meet locals who are delighted to share their homes, cuisines, and cultures with you. Have you ever wanted to learn about rowing across the Atlantic or the inner workings of the Monte Carlo Grand Prix? 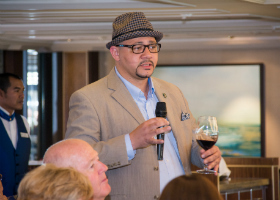 On select Windstar voyages, satisfy your curiosity and enhance your understanding of the local culture by listening to our onboard lecturers. We’ve curated a group of speakers designed to bring you an insider’s perspective on a multitude of intriguing topics. Listen raptly as your voyage becomes more than just a vacation – and a thought-provoking exploration of enchanting lands. Windstar Signature Expeditions is an immersive program that features half a dozen expert guides who stay on board throughout the voyage, giving informative talks and taking guests on optional adventures by foot, by kayak, or by Zodiac boat - sometimes launching straight from the ship in remote places like Misty Fjords and Kenai Fjords. 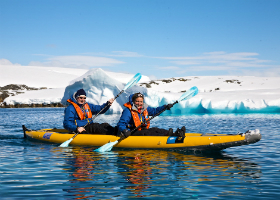 It's Alaska at its most authentic, exciting all your clients' senses to its magnificence. Delight your palette with onboard cooking demonstrations featuring James Beard Foundation chef recipes. From wild striped bass with tomato sage “fondue” to lobster risotto, our Windstar chefs will take your taste buds on a journey through local cuisine. 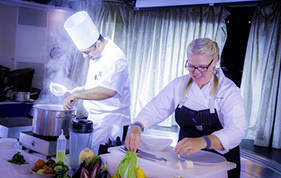 For a special tantalizing treat, join Windstar on one of our voyages in the James Beard Foundation Culinary Cruise Collection, where a James Beard Foundation chef will show you how to elevate your own culinary skills. It’s a taste of enrichment you’ll never forget. Wine tastings, SCUBA diving, tours with locals and more — Windstar offers a variety of unique excursions that will add more depth and immersion to every day of your journey. 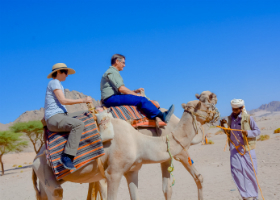 Each meticulously planned excursion meets our highest standard of quality in safety and professionalism. Ensure your peace of mind knowing that you’ll always make it back to the yacht on time. 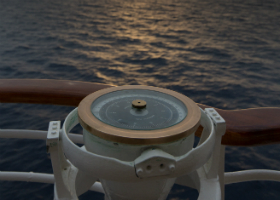 Discover Windstar’s onboard magazine, 180 degrees. Focused on immersive, vibrant travel experiences, the magazine introduces our most popular destinations, with handy notes after each article noting which itineraries visit the port. Read about the history and culture of our most popular destinations over breakfast al fresco, or by the poolside as you sunbathe. Start planning your next cruise with the included cruise calendar or simply be transported to wondrous lands. 180 degrees is available onboard now and online.